Mickie Greene of Wuescher’s Garden Accents of Bellefontaine speaks with people attending the Champaign County Preservation Alliance’s Historic Home & Garden Tour on Saturday. Greene and her wares were set up in a tent outside a “restoration under progress” house on the tour located at the corner of West Reynolds Street and Walnut Street. The Champaign County Arts Council hosted a luncheon during the CCPA tour on Saturday at the gallery space the council shares with local artist Mike Major. Pictured in the foreground are two statues framing the luncheon guests. Market Street Community Gardens were part of the weekend’s tour. The gardens cover a once-vacant lot on East Market Street and include raised beds full of vegetables and trimmed with flowers. Each raised bed is tended by a community member or group. The Longaberger garden, located at 343 Scioto St., was blooming with color on Sunday. 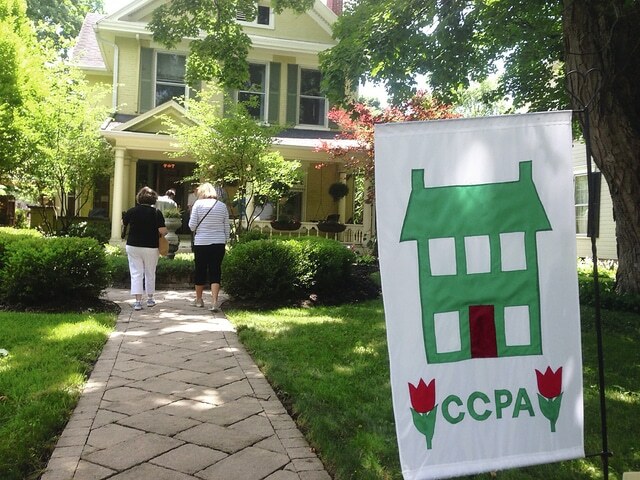 The Champaign County Preservation Alliance’s 23rd Annual Historic Home and Garden Tour was a success Saturday and Sunday despite a persistent rain on the tour’s first day. The event hosted in Urbana shuttled tourists to 13 different historic spaces that owners opened to the public. Each site offered detailed stories about families of the past and present, and information on preserved and restored aspects of the properties. Volunteers and sponsors from across Champaign County gathered in Urbana to help tell stories that characterize the community. Each site was staffed by volunteers, and as five-year volunteer Suzanne McCoy explained, “The head hostess calls from a master list, asking for about 40 to 45 people per house.” Volunteers were assigned specific areas of homes and gardens to help guide visitors and answer questions about features. Money the preservation alliance raises is granted to various restoration projects in the community, helping to preserve the character of local buildings and facades. Despite rainy conditions on Saturday, tourists still came out to support the annual event, laughing with friends and volunteers on the doorsteps of homes as they placed the provided cotton booties over their shoes to prevent from tracking in mud. Historic home and garden owners not only welcomed visitors and volunteers into their homes, but also musicians and vendors including violinists, guitarists, pianists and small business owners in the community. While admiring homes and gardens visitors could enjoy music, shop and head down to the Art Gallery on Miami Street for refreshments and snacks.